The slogan for the Clark candy bar was, “I want a Clark bar.” Though you may have wanted a Clark bar, often you weren’t able to get the confection. 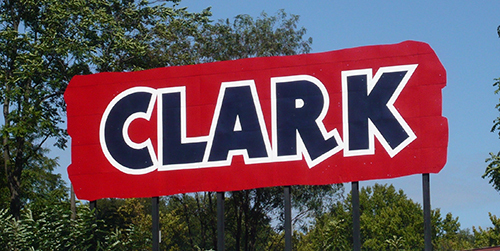 When the manufacturing of the Clark bar left the area, the only reminder of the city’s candy-producing past was the Clark bar sign atop its former production facility on the North Side. The Clark candy bar was invented by Irish immigrant D. L. Clark in Pittsburgh in 1917. The candy bar became the first successful “combination” candy bar, combining a caramel core surrounded by crispy ground peanuts and covered with a thin veil of chocolate. The candy was developed to send to troops serving in World War I. From 1911 until 1983 the candy bar was produced at a manufacturing facility on Martindale Street on Pittsburgh’s North Side. Sadly, the Clark bar was sold to the Leaf Candy Company in O’Hara Township in the 1980s and changed hands again when the New England Confectionery Company, manufacturer of Necco wafers, purchased the recipe and production equipment to make Clark bars. The bar lost its caramel center during this time. But finding them to purchase at all was still difficult. In late 2018, the Boyer Candy Co. from Altoona, Pennsylvania, makers of Mallo Cups, purchased the Clark bar recipe and candy-making machines from New England Confectionery after they closed. Boyer plans to make Clark candy bars once again in Pennsylvania, 101 years after they were first introduced to the world. Soon Pittsburghers will, once again, be able to enjoy a Clark bar.